Merry Christmas, dear readers! This week if you have a little extra time in your Christmas stocking, be sure to join Ebeth at A Catholic Mum Climbing the Pillars, where she has posted the Christmas edition of "Catholic Carnival" this week. Thanks, Ebeth! “...there is nothing more beautiful than to be surprised by the Gospel, by the encounter with Christ. There is nothing more beautiful than to know him and to talk to others of our friendship with him”. (CDF, "Doctrinal Note on Some Aspects of Evangelization," 7). Lately I've been thinking about what it means to "evangelize," something we as Catholics are all called to do. As a convert to the faith, it occurs to me that my perspective on this subject may be somewhat different from that of some cradle Catholics. First, I have experienced firsthand effective evangelization (as opposed to "evangelism," the word most frequently used by Evangelical Christians). My preconceptions and misgivings about the Church crumbled like a proverbial house of cards largely thanks to the dedicated friendships of brothers and sisters in Christ who took to heart the admonition of St. Francis of Assisi: "Preach the Gospel; when necessary, use words." Ironically, none of these grace-filled individuals were apologists or catechists. Rather, they were "ordinary" and usually soft-spoken channels of extraordinary grace. The Catholic college friend who continued to support me in my missionary work (in Senegal) even after she learned that I hesitated to take her money because she wasn't a "real" Christian. The Catholic mother of a school friend who visited me in the hospital and figured out how to wash my hair for the first time in many weeks. The Catholic boyfriend (I write about him in greater detail in the March/April issue of "Canticle) whose example made me search out for myself whether Catholics are, in fact, "saved." I do not write these things to minimize the importance of catechetics and apologetics. Once my heart was open to receive truth, my mind was persuaded by the books and tapes and teachings. Like many converts, I soaked up the eloquence of Scott Hahn, Karl Keating, and (in my case) Sheldon Vanauken. But my heart was wooed and won by the patient, unfailing love of simple humility ... and sheer grace. And so, I read with interest the Holy Father's recent letter on evangelization, and his acknowledgment that this important work is about much more than imparting dogma. He writes: "... to evangelize does not mean simply to teach a doctrine, but to proclaim Jesus Christ by one’s words and actions, that is, to make oneself an instrument of his presence and action in the world" (CDF, "DNSAE", 2). Which brings me to the second half of my reflection on evangelization, namely, my experiences of evangelism (i.e. my efforts to bring others to Christ as an Evangelical Christian). I had nearly completed my Bible school studies when a certain guest lecturer addressed my class on the importance of "church planting." 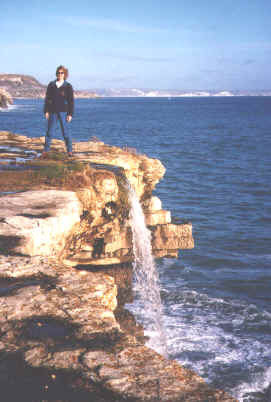 Soon the idea caught on, and many of my classmates made exalted plans to form teams and go off to the most remote parts of the world to start a church (in most cases, having never started one here at home). This didn't make sense to me; I had decided my time was better spent by reaching out to local immigrants and teaching them English as a Second Language (ESL). I said as much to one of my professors, who actually patted me on the head and said, "That's OK, Heidi. You go ahead and teach English ... the rest of us will get on with God's work!" I had been instructed in the finer points of street preaching, door-to-door witnessing, and homiletics. I wasn't afraid to witness to the truth. But it seemed to me that the most effective witness is based not on sheer eloquence alone, but on relationship. And that, I realized, required time. I had listened with an increasing sense of discomfort as classmates (and a few of my teachers) come back from "witnessing," declaring with great pride how they had silenced their opponent with their finely honed arguments. They had stripped away lies and exposed falsehoods, lobbing Bible verses like so many Molotov cocktails. As I listened, however, I wondered: Is the whole point of evangelism to silence opponents, or lead them to Jesus? When I raised this point, however, they silenced me as well. "Don't you know, Heidi, that while you're teaching nouns and verbs and ladling soup, souls are going to hell every day? Don't you know that, because you have not shared the Gospel as clearly and forcefully as you should, YOU are responsible for their fate?" Squirming at the possibility that they might be right, I began to take a more direct approach, spending part of each "lesson" trying to persuade people to accept Jesus. The sense of urgency began to border on obsession. What if this was the last time I ever saw these people, and they died that night without ever praying the Sinner's Prayer? Would they one day (at the Judgment Seat) accuse me of not trying hard enough to show them the truth? There was another problem as well: It began to dawn on me that I had become so preoccupied with the state of other people's souls, I did not give much thought to my own. I had already "accepted Jesus," you see -- and so there was no need to worry about the state of my own soul. I was going to heaven. Gossip ... resentment ... anger ... even lies. None of it mattered, or so I thought; the blood of Jesus covered me. Years later, I was struck by the fact that no one -- not even the director of the RCIA program -- used an ounce of force to convince me to become Catholic. "Don't worry, Heidi," she consoled me when I confessed a few weeks before the Vigil that I still didn't "feel at peace" about joining them. "If you decide not to enter the Church at this Vigil, God may have other plans for you. Obviously you love God and want to do His will. Relax, and let things unfold a bit more. There is no hurry ... God has all the time in the world." It was precisely what I needed to hear. The knot in the pit of my stomach unraveled, and I went to my first sacramental confession knowing that -- whatever else happened to me -- God knew my heart belonged to Him. "...every activity of the Church has an essential evangelizing dimension and must never be separated from the commitment to help all persons to meet Christ in faith, which is the primary objective of evangelization: 'Social issues and the Gospel are inseparable. When we bring people only knowledge, ability, technical competence and tools, we bring them too little'" (CDF, "DNSAE", 2). This is the title of my conversion story, part of which I have already written about here. It has been a little disorienting, at times, to encounter Catholics who -- with all the best intentions -- "defend" Christ and His Church with the same zeal I used to encounter in the Evangelical camp. I have to remind myself that zeal has its place, that truth sometimes does cut like a sword, that the "faith warrior" has an important place in the Kingdom of God. And yet, there is room for the more cautious among us as well. There is a need for medics as well as soldiers; mothers who nurture as well as fathers who lead. In His Mercy, God has given me a glimpse of certain dangers so I can avoid them. To do that, He led me from church to church -- and at times, even from country to country. As a "Cross-Cultural Catholic," I depend on God's grace to carry on the work He gives me to do with a measure of humility and prudence, knowing how easy it can be to fall. "Indeed, since the day of Pentecost, the Church has manifested the universality of her mission, welcoming in Christ the countless riches of peoples from all times and places in human history. Beyond its intrinsic anthropological value, every encounter with another person or culture is capable of revealing potentialities of the Gospel which hitherto may not have been fully explicit and which will enrich the life of Christians and the Church. Thanks to this dynamism, 'tradition, which comes from the Apostles, makes progress in the Church by the help of the Holy Spirit'” (CDF, DNSAE, 6). Yesterday I got a card in the mail from my daughter's religious education teacher, thanking me for inviting her to our church's Advent tea. I was so touched that she would make such a special effort (a lovely handwritten note accompanied the card) to thank me for the invitation. Especially since she goes to so much trouble every week to help my daughter to grow up to know and love God! Her note reminded me of how little it takes sometimes to be a force for good in another person's life. As Catholics, we are sometimes hesitant to extend an invitation to church to a friend or neighbor. This is one area that comes more readily to converts (at least those from evangelical traditions), who have been on the receiving end of that invitation, and know what a difference that casual invitation can make! Is there someone in your life God is asking you to reach out to, to show some "spiritual hospitality" to this individual? Perhaps for midnight Mass, or Christmas morning (followed by brunch). Or perhaps it is a softly-spoken word of correction or insight at the holiday table. Sometimes a gentle prompting is all that is needed to return a lost sheep to the safety of the fold! This week's Catholic Carnival (#148) is being hosted by Bryan Murdaugh. Stop by and see some of the thought provoking posts that were contributed this week! 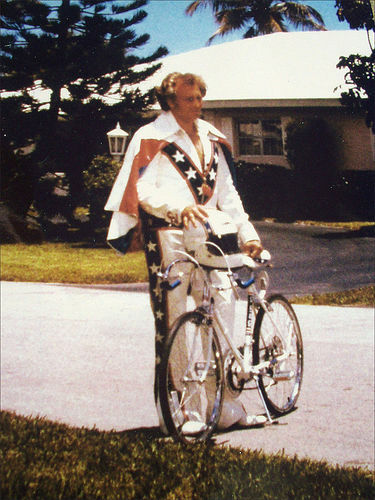 Bobby "Evel" Knievel, the 70s icon of daring-do, has died. At 69, he had spent most of his adult life defying death and avoiding the IRS, but in the end Knievel did not prevail ... at least, not with the Grim Reaper. 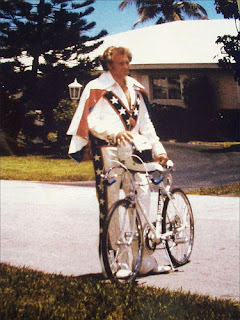 I didn't know Mr. Knievel, who was a complex figure even to those who knew him well. Last year he "found God" at Robert Schuller's Crystal Cathedral, where the Rev. Schuller, Sr., baptized him after a profession of faith. This much I do know: To suggest that we can "ride like the devil" for most of our lives with impunity, so long as we pay God a certain amount of lip service before the final credits roll, is a gamble even more foolhardy than Mr. Knievel's ill-fated leap across the Snake River. Authentic faith gives us courage to walk the purgative, illuminative, and unitive way; step by step, we extricate ourselves by God's grace from the stubborn bits of self that keep us from experiencing the Fatherhood of God in a way that is ... well, childlike. Read that again. Now, who in their right mind would prophesy and exorcise demons and even minister in the name of Christ, who did not also sincerely believed himself (or herself) to be a Christian? Does this sound like someone unfamiliar with the Scriptures? Like someone who has never responded to an altar call? God never intended any of us to be a spiritual Lone Ranger. Unfortunately, this tale of spiritual isolationism is found again and again in Church history -- both ancient and present day, up to and including church hoppers and shoppers. All of them "feel led" or believe "God told me" to put their own souls in spiritual jeopardy, never considering the possibility that the still, small voice to which they were listening might have malevolent intentions. For centuries men and women have twisted the Scriptures to fit their preconceived agendas; they "felt led" ... all the way to hell. Which is why Jesus did not leave us with a book ... but with a body of believers who were entrusted to pass His message on to others. He knew a book could be misinterpreted and misconstrued (even with the very best of intentions), and that His Holy Spirit could keep the sheep safe only so long as they stayed in the fold. "I am the Good Shepherd..."
Do the absolute claims of Christ and His Church make you uncomfortable? Do not put too much store in your own "feelings," or blame the tuggings of your own preconceived ideas of how God operates on the Holy Spirit. Jesus never said that the narrow way would be easy or well-lit. (Though He did promise respite for those weary of the struggle.) Instead He calls us to be soldiers, giving us weapons equal to the battle. He fortifies us with sacraments of initiation and healing, and sends us out to do battle -- first, within ourselves. As we enter this Advent season, let us always keep in mind that the enemy's greatest trick is one of distraction. So long as our eyes are on the perceived "enemy," he is free to work all kinds of mischief in us. The subtle (or not so subtle) spiritual pride that causes us to look down on a brother or sister in Christ, the feelings of anger and offense at some perceived slight, the "busyness" that keeps us from choosing the work God most wants us to accomplish. From faltering when I should climb higher. The passion that would burn like fire!